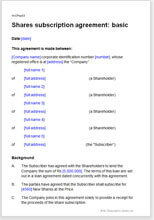 This short agreement is for a new shareholder to subscribe for new shares to create a minority or majority holding in a private company in any industry. It is intended for smaller and uncomplicated transactions: for the introduction of a family member into a company, a senior employee or director buy-in, the appointment of a new non-executive board member who is incentivised by a small shareholding, or for an existing shareholder to invest additional equity. It differs from our standard share subscription agreement by having no warranties, so the subscriber is likely to be familiar with the company already, or trust the existing shareholders, or be buying in at a discount. The subscription is for cash, with payments in two stages. The final price to be paid is dependent on the profit of the company in the next set of accounts. If the profit is not as promised, the subscriber can deduct an amount from the final payment. The penalty reduction of balance is calculated by reference to a simple, flexible formula. This agreement is for the situation where new shares are issued - the buyer does not purchase the shares owned by someone else. If you require warranties, see our standard share subscription agreement.